I had a question about the safety of the inside of the this item. There is no information about the inner parts. Also, if this is an import, where was it imported from? There was no where on the product site to ask questions. Beware people, when there is no contact listed. I had a question on what the product is made of, looks like aluminum to me instead of stainless steel. Couldn't get a live body to talk to. After seeing all the problems people had, I won't be using this product. If they're too cheap to provide a real person to talk to we don't need their product. Horrible order experience via electronic phone ordering. I only wanted to order the updated Power Pressure XL or whatever the upgraded model's name is. The electronic "person" did not give me a chance to stop the order process, did not give me a confirmation number. I did get three different numbers to call but the electronic "person" said they did not have record of my order and to call back in five days. I looked at my activity on my credit card and there was a charge for $79.95 and that is $40.00 more than my charge should be. I am very upset and will be reporting this to BBB and consumer reports. Due to the fact I cannot speak to a real person I am going to state I am a person that used the product simply because I want some kind of response. And I hope it will not be another electronic person. Since I only ordered the product 04/17/14. No I have not used the product. How was the charge only $79.95 when the unit costs $99? Did you get a special deal? Its been since March and I still have received mine. I'm going to share with you the customer service number 973-287-5187. I hope that helps. Have you called the number that Ty had kindly provided, and were the agent(s) able to find your order? We apologize for the confusion on your order and experience. If you have not called and receive answers on your order, you may check your order status on the following website: www.customerstatus.com If this does not help you, I am more than willing to further assist you. Thank you for your time. Our Grandsons and my husband and I saw this infomercial on Sunday June 1st. the boys said order one for you and our Mom. So I came here to check it out, thank God. There is no way I would order this product or any other product on an infomercial. You need a live person to answer the phones that can talk slower while explaining everything about the charges to your card. Then they start on all the stupid offers and go too fast when going through them and you can't get anyone to talk. I am pissed. I don't even know how much was charged to my card. I always check reviews before I order off a TV show. After all the negative reviews I think I will pass! See below why it is important to check! I have ordered off line without checking and got screwed. Ordered a Nuwave cook top with free cookware and free cook-top and got screwed, no cookware I got two boat anchors unless I buy their cook ware, Walmart has it for $80. + pans Thank you for your honesty. Thank you for posting this. I tried to get tot talk to a REAL person instead of a machine before ordering and couldn't. I won't deal with a company who can't provide a real person to talk to! Thank you all for taking the time to post your horrible experiences with this company. I was going to order but always check reviews. You saved me time, money and nerves!! Hope you all get your money back. Good Luck. I was going to order one of the pressure cookers, I read the reviews and I changed my mind. I wouldn't want to wait that long for my product, just to end up canceling my order. I will go elsewhere! I can't believe what my husband and I went through just to order this product. My husband placed the order on Sunday through toll free number from TV and had a horrible experience. It did not provide the order number and the line was disconnected. We've checked with our bank and the amount was deducted already, however, couldn't find our order through their website! So, I called on Monday to get the order number and find out what happened to our order, I found out through customer service person name Alicia (I37) that our order does not exist! She ask me to wait 24 hours plus 6 - 8 hours more for placing the order during the weekend call back again. On Tuesday I called again and spoke with Britania (B24) and she found our order; however, our order did not include the accessory kit that we've purchased. She mentioned that will cost $17.95 more. I've explained the deal that was mentioned on TV, but that deal is only through the website and does not include the option of adding the accessory kit with it and we can not order just the accessory kit on the phone alone. She put me hold to speak with the supervisor and still can not place our order. So, I've asked to speak to the supervisor. After waiting for long time, she (Tashania) came on the line. After explaining what I went through, she hung up on me. I called back and got another supervisor (Sheneca G09) and she also hung up on me. I never yell or use bad language to speak to them, but they just didn't want to deal with my situation. After I spoke with my husband, we've decided to cancel the order without them hanging up on me. I spoke with Samuel (M58), who was very understanding and canceled the order for us. We still have to wait 48 hours for our money back and there's no guarantee that we'll be credited; but we don't want to deal with this company anymore and want nothing to do with any of their products ever again! I am terribly sorry to hear about your experience with our company. You voice matters to us and we will see to it that we improve on all areas you have mentioned. Our desire is to restore your confidence with us, and to make you happy as a customer. You did not deserve the service you have mentioned. If you provide your order number, I will see what I can do to rectify this problem. Thank you for your time, concern and your opinion. The worse customer service ever. I saw the commercial for this fabulous pressure cooker/slow cooker and just had to have it. I placed my order on 4/5/2014 via the website and it is now 4/23/2014 and I still have not received the product nor a confirmation email of my order (which most companies provide). I tried calling the so-called customer service number and all I got was "air". No one on the other end to answer. I emailed Tristar Products, the company that distributes this product for a response and as of today, no response. I sent the online email submission on 4/19/2014 and no a peep! I am highly debating on whether to cancel my order and to let others know that this is not a good company to deal with. I am still waiting for someone to respond and better yet, send me my pressure cooker! Going on three weeks now. Thank you so much for your comment, we apologize that you have not received the customer service you deserve and for the long delay on your order. We do advertise a 4-6 week time frame for your delivery, but we also understand that receiving the product as soon as possible is always important to our customers. I am more than happy and willing to help you with all your issues on your order. If you provide your order number to me, I will look into the matter to satisfy you as a customer. I will check the status of the order and will see all possible solutions. Thank you. By the way, if you need to speak to an agent over the phone about your order, you may call our customer care number: 1 (973) 287-5159. Can't track the order or talk to any body. Is this a RIP OFF? I'm still waiting for mine. Ordered it in March. But I will share with you the customer service number. They pick up every time. 973-287-5187 hope that helps. Have you received your tracking information yet? If you provide an email with your order, we normally send out the tracking information to you once it has shipped. May you provide your order number to me? I will look into your order to see the status. If you need to speak to an agent over the phone about your order, you may call our customer care number: 1 (973) 287-5159. If not, I am more than happy to further assist you with the status of your order. Thank you so much, you are appreciated. I've been waiting for this since March and called them today 4/30/14. I was told it has been on back order because it's a high in demand product and won't be shipped until May 15. I've never waited for anything this long in my life but here is their customer service number and they're going to say they will expedite the order (yeah right) 973-287-5187. I hope this can help someone but at least you will reach a live person. It says 3-4 weeks for delivery. You bet! it helped me not to make that call to order. thanks, Ty. We apologize for the delay on your order. We are making every effort to send the Power Pressure Cooker as quickly as possible. If you may kindly provide your order number, and I will see what I can do for your order. Thank you for your patience. Thanks for the phone number. 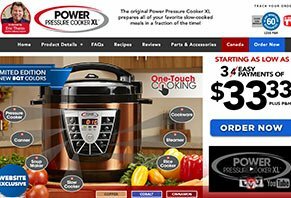 I got a refund for the power cooker & juicer, but they forgot the 6 year warranty for $30.00. I was able to call the number and got the refund. So after a long wait I get my box. No books included so how can I use it without the books. I call them they said they will send them. Then I look at the pro which I paid more for and there are no preset buttons like they said there were. Really mad now, might return and get the cheaper one. Very unhappy. I won't be ordering. Thanks, Cheryl. I'm watching the infomercial right now. Please return it and don't let them get away with what they are doing to people. I don't see how this is legal. I ordered the power pressure XL it took nearly a month to finally receive. I was so excited that I opened it up and read the directions on how to start using it. The meal was ok. Then the next day I went on YouTube to try and find some recipes to try and realized I got the wrong pressure cooker. The one I got was the power cooker, I called customer service right then to find out what happened. Basically they were in a back order and they claim the one they sent me is the more expensive model. I saw it on Walmart's site for $79.99. Hmm, no wonder they asked if I'd like a $30 refund. I think they made a deal with Walmart and sent people a cheaper model in hopes people wouldn't realize. I won't be ordering from this company again. That is a exactly what happened to me? They said the Pro was an upgrade from the XL! This is bait and switch at its finest and is illegal! Thanks for posting this! I just called the company because of your post. I paid 130! They will be refunding me $30. I still paid $20 more than the Walmart price, though. I feel ripped off. I thought I was ordering the XL with 6 year warranty. I accidently ordered a juicer too. I sent the cooker and juicer back and received a refund for them, but not for the six year warranty. I called 973-287-5187 spoken to two people explaining that I also wanted the refund for the warranty since I didn't have either product. Supervisor Tracey was able to get this refund for me. I would caution anyone ordering to make sure you know what you're ordering. I'm worried about a little bait and switch going on here. I wanted the XL for $99.99 instead received the basic cooker for $129.99. I didn't want the juicer, but couldn't figure out how to get out of phone call - it just kept going on and on and on. I think I also signed up for some other programs that I'm going to have fun canceling too. I bought a power pressure cooker from MACY's. It works great, I just got sucked into the TV add thinking it was better. Next I need to be fully awake before picking up the phone. first and foremost, I paid for my order in one lump sum. It took almost six weeks for them to ship it. Secondly, after following the instructions on a basic steaming of vegetables, they came out ruined. The instructions are so hard to articulate, and customer service is no help at all. I have learned my lesson. No more ordering crap from in commercials.